It's the first week of November and the cold weather has moved into Chicago. Luckily, November is National Knit a Sweater Month. This challenge is inspired by the National Novel Writing Month, a challenge for writers to write at least 50,000 words in a month. As makers, we are challenged to make a sweater (but I'm not counting how many stitches you put in it)! Let's get ready to make some warm and snuggly sweaters for this sweater weather we will be enjoying for the next couple of months. This sweater is a relatively easy knit with wonderful texture. Designed for an oversized fit, this sweater is perfect for the coming winter months. I paired it with Woolfolk's FAR in color #14. 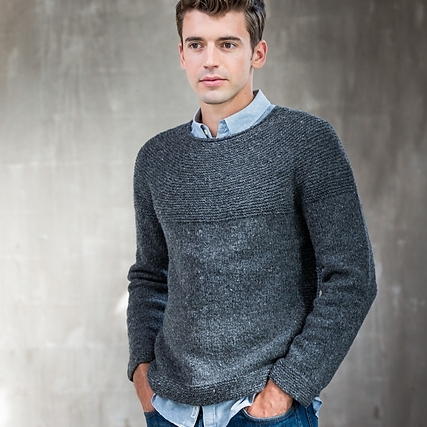 A solid color for this sweater will help show off the texture as you wear it! This is a classic cardigan perfect for the crocheter who wants to make a timeless and versatile piece. We all know layering pieces are an important staple here in the midwest. I suggest Why Knot's Sweetheart line in the color Inara. This single ply yarn will work up soft and keep it's shape as you wear it. It's a great addition to your office sweater collection, or for running around town. Another easy sweater you can wear casually or take it into the office. The navy color of Woolfolk's, FAR, color #11, is a deep blue that works well on just about anyone. And let's be honest, everyone wants a super soft sweater for the winter months. 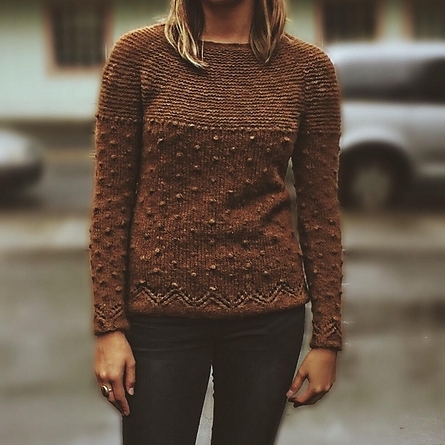 This sweater is a creative use of crochet cables, crating a striking sweater perfect for layering. Mix and match your favorite colors to create a dynamic sweater with this pattern. I paired Brown Sheep's Prairie Spun colors Raincloud and Coneflower, for a fun dynamic with neutral grey with a pop of fuchsia.